Got a big excursion planned this winter? Whistler? Vail? Stowe? St. Anton? You gotta have the right gear to get your snowboards there, and we've got the snowboard travel cases you need. 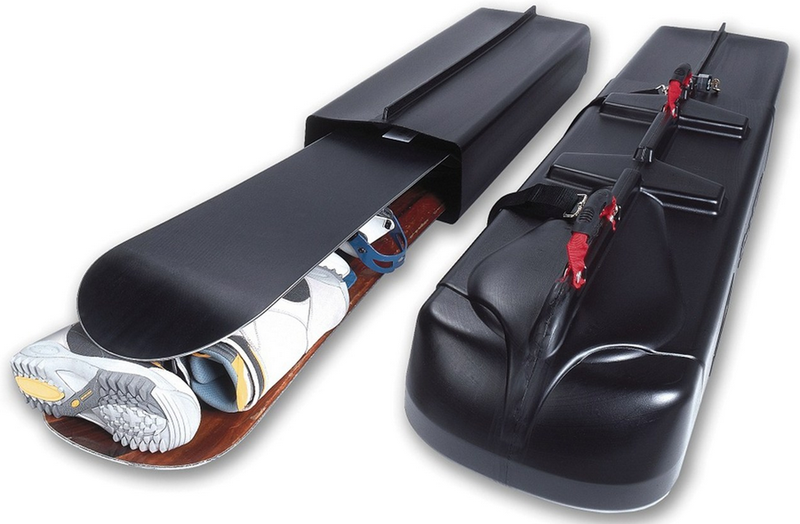 The Sportube Snowboard Travel Case is made out of High-Density Polyethylene which makes it strong but lightweight. The hard plastic shell offers superior protection over a soft bag and creates a shield around the equipment protecting its contents better than a nylon bag. The hard shell plastic doesn't tear and is resilient to dings and bangs. There are no buckles, zips or permanently attached straps to get ripped, torn or broken. So it will hold up better and last much longer than a soft bag. Some airlines will only take liability for skis and boards packed in a hard case, soft bags may require a signed liability release! Not this Sportube hard case. We also have a variety of "soft bag" snowboard travel cases. The features and price points on these cases range - whether you want a standard, zip case to carry a single snowboard on a weekend jaunt, or whether you want a heavier-duty, adjustable length, wheeled snowboard travel case for the trip of the winter.